I’m a slug. I like to ride my bike, though. It was all this bike riding that kept me from gaining the Freshman-Fifteen, Sophomore-Sixteen, the Junior-Year-Jelly, and now that I’m a senior, it better keep me slim during all this internship anxiety. 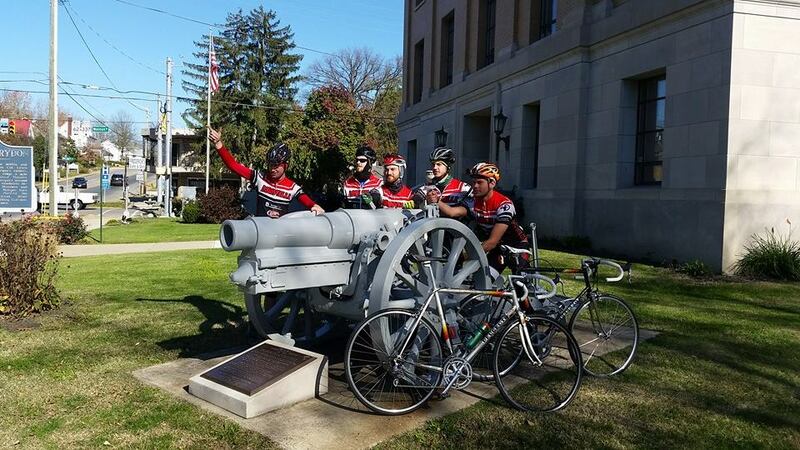 The team just went on a ~70 mile frolic through the Southern Indiana hills to Corydon, Indiana, the first State Capitol of that breathtakingly beautiful, God-fearing state (Let it be known, I’m from Indiana), and I was mercilessly dragged up monster hills by dudes that are WAY faster than I am. Corydon, Indiana! Jason and John found dinosaur bikes to train on. Here’s the real beauty of what I just said: The UofL cycling team went on a bike ride and I got whipped around by dudes faster than me. 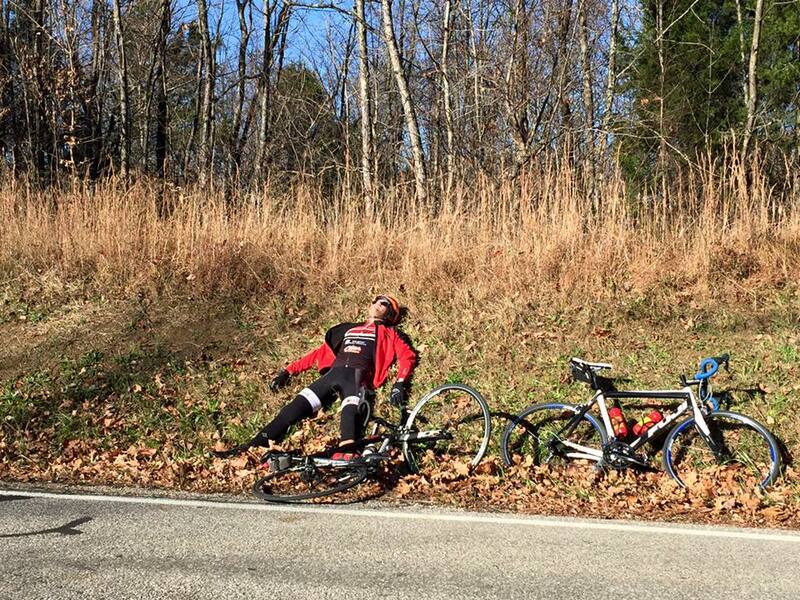 There was a time, exactly two years ago, November 2013, when Josh Goodman and I WERE the UofL cycling team. Hold on while I reach for my box of tissues. Well, Josh and I are still slow, but at least we can take advantage of our “old men” status to bring along other riders. We’ve managed to build this team to give equal opportunity to advanced riders—see John Francisco, Ben King, and Mark Renn—and the new generation—see literally everyone else on the team. The first two years have been a slow development, kind of like when you get your brand new Felt Bicycle—an unfair advantage– and the cables are setting in and you’re figuring out what it’s like to ride with the best frame geometry on the planet. Now, a new era is about to begin. The organization is having its first-ever full election on Nov. 23 which means I will dutifully step down as President (now I understand why dictators don’t respect election results). Hold on while I grab another box of tissues, the other one ran out. This new President is going to have the joy of being in charge of the first ever bike race on campus in March 2016, will have the stress of dealing with opinionated seniors like me, and will experience the glee of running the team. Maybe they’ll ride their bike faster than I do. I’d love them to, because honestly, I only want the best for this organization. And it’s cool that others do too. Recent graduate Jason Eisenmenger was literally –original Oxford Dictionary definition– pushing me up a hill near the end of the ride today when he said, “I’m moving to Chicago next month.” My first thought was, “Oh crap, this dude has helped us develop the team so much this past year and he’s been pivotal in setting up this race.” He tried to lessen the blow with, “Although I’ll be far away I want to help as much as possible. I’ll stay in touch.” And that’s when sense slapped me across the face like a cold hand. I said, “That’s awesome!! I’m really happy for you!” because in reality, college exists to build something for one’s life, and here he is with an incredible opportunity to make something happen for him and his wife. That’s why I love that this organization is getting a new president. This individual will improve their leadership skills, will develop business acumen, and will have an excellent piece on their resume. It all fits in with the grand scheme that college prepares one for real life. What’s even better is that they won’t have to figure it all out as slowly as I did—remember I’m a slug?—and they’ll be able to make an impact immediately. I’ll tell you one last story from the ride. I’ve been slow for so long now that I’m proud to be really good at it. Ryson Walden, who I’m convinced is from the French Alps, beat me up Doolittle Hill by about 5 minutes aujourd’hui. When I got to the top, I carefully rested my bike on the grass and collapsed on the ground. John said he was amazed at how I was able to ride up Doolittle Hill that slow and not put my foot down. At that point, I just smiled, munched on my Clif Bar, and covered my eyes with my Flower Power sunglasses so I wouldn’t see the haters. Maybe I didn’t rest my bike on the ground very carefully after all. ← UofL Triathlon: A New Inspiration.